The table above was revised on 08/30/09. 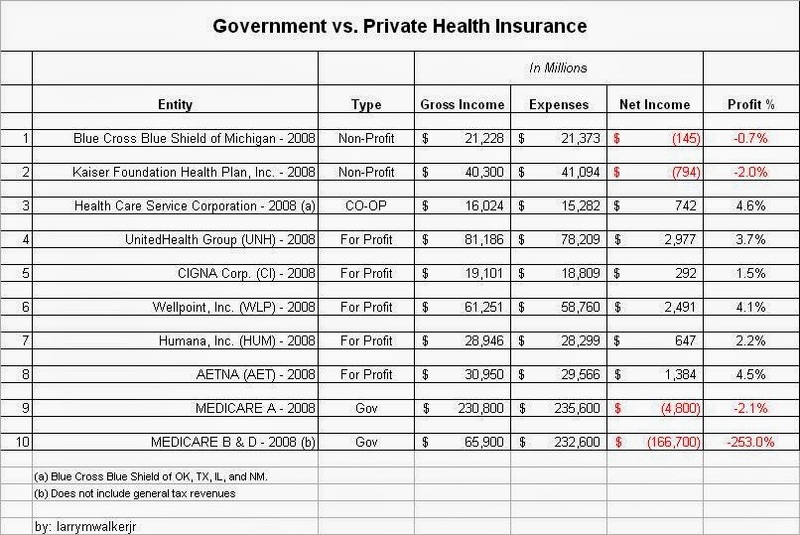 First of all, 60% of private sector health insurance providers are non-profits who must by law disclose their records to the public. You can find their tax returns online including information about programs, and compensation. Most of the remaining companies are publicly traded and by law must file 10K and 10Q reports with the SEC. Their financial information and compensation information is also available online on various websites. In comparing the three types, it is clear that something is wrong with the federal government. I have to disclose that I did not include the funds that Medicare obtains from general government revenues, above, because this money comes directly from income taxes. Medicare Part A is funded primarily by payroll taxes assessed on an individual’s total wages. Medicare B and D is funded primarily by premiums charged to Social Security recipients (which I might add is kind of redundant). To be brief: For-profits are by necessity in the black. On the other hand, government-run insurance is in the tank. In fact, Medicare is projected to exhaust it’s assets by 2017 according to the 2009 Annual Trustees Report. So I ask this question. 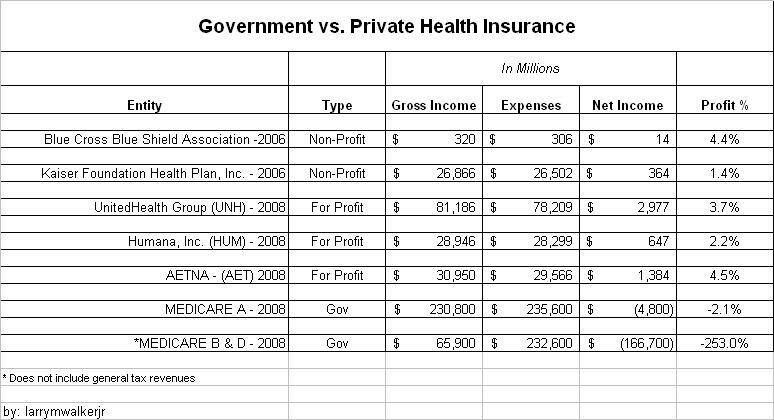 Who is better qualified to manage health insurance: ‘government workers’ in Washington, DC or the Private Sector? I think you know the answer. Solution: With proper regulation and oversight, turn over Medicare, and Social Security to the Private Sector. Bigger government is not the solution, it’s the problem.